I have been meaning to catch hold of someone who can help me put together a Dubai Budget Wedding Shopping post. If you’ve been to wedding exhibitions in India, you must have come across Dubai stalls. They have some of the most exquisite wedding and pre-wedding wear selection. June last year, bride Anam reached out to me. 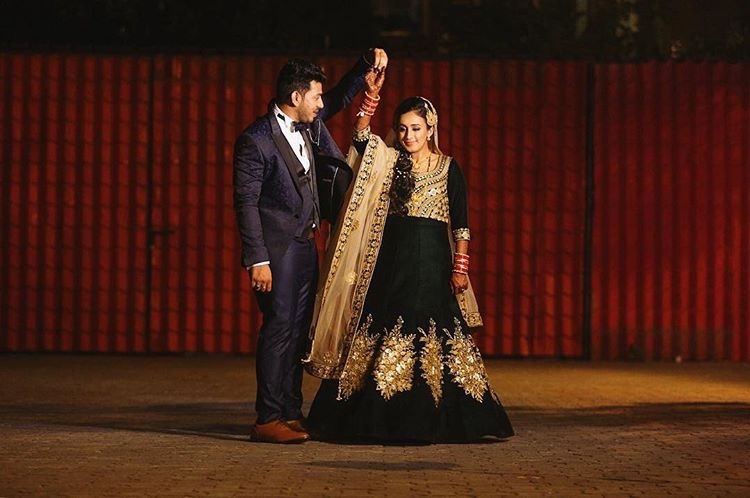 Her wedding was in November 2018, and like any other bride-to-be, she had questions about wedding photographers, double dupatta and so on. We lost touch after those few conversations. So once Anam got in touch with me post-wedding, I was just so happy to see all of her dreams of a fairytale wedding had come true. It almost felt like she was my bride. A quick chat later, I found out she got married in Mumbai but pretty much did most of her wedding shopping in Dubai. I knew just then that I wanted to get her experience jotted on Frugal2Fab for all budget brides looking to shop in Dubai. So, this is now Anam’s blog post. You will find all the details not only of her own Mumbai wedding, but her experience on Dubai Budget Wedding Shopping. My husband’s name is Tohid. Both of us are originally from Bombay, but are staying in Dubai. We met each other through my best friend, who was mutual to us, back in college days. Both of us moved to Dubai in 2014. I moved with my family, whereas he moved here for me, so that we didn’t have to face long distance! And after over 5 years of sneaked-out dates, crappy jokes, silly fights, cuddly hugs and ever-growing love, we got married to each other! The wedding was in Bombay, but we did the entire shopping in Dubai. We had five events spread over a week, following Islamic traditions – Sangeet, Haldi, Mehndi, Nikaah (Wedding) & Walima (Reception). My Sangeet was a very personal affair with only the close family members in presence. I had no particular look in mind for it, except that I wanted to pair the outfit with my Adidas shoes. It was truly a last-minute-done outfit. When I saw this dress material in a store while shopping for my family, I instantly liked the ice colour paired with floral print bottom. I picked it up and got the outfit stitched (top as well as skirt) by a local tailor, giving him a picture for reference. For makeup, I went for casual makeup and hair with minimal accessories, keeping the overall look comfortable, for all the dancing. Getting the outfit stitched, for smaller pre-wedding functions, is a great cost-saving option. I wanted to have a distinct look and outfit colour for each function. Mehndi is all about bright colours usually. But I opted for a readymade pair of pastel lilac kameez with gota handwork and off-white sharara pants. I wore the Rajasthani style matha-patti to add statement. My reception outfit costed AED 1400. That’s roughly INR 26,000. At first, I got my wedding lehnga custom-made, which didn’t turn out to be as envisioned. Two months of patience and efforts got wasted, after which I had no choice, but to go for a ready-made one. So this wedding lehnga was hate at first sight for me! It was too heavy for my liking. The only thing I liked about it was its colour – bold and gorgeous! After number of rounds to the store and upon being consistently insisted by my entire family and the groom (all of them loved it from day one), I finally decided to go for it. Over three rounds of trials and conversations with my MUA, the outfit totally grew on me. Now I know, it just couldn’t have been better! I definitely wanted to go for a double dupatta look, though customising the second dupatta was another challenge altogether. The only brief I gave to my MUA was that I didn’t want the makeup to be too loud and glittery. And she did an amazing job! The overall look was simply royal. I chose to go for a classic bun adorned with gajras. I believe, you can never go wrong with it! Additionally, I wore my Mom’s wedding dupatta for my Nikaah. Years ago, when she showed it to me, I instantly decided to wear the same, whenever I get married. My wedding outfits cost was AED 3000. That’s roughly INR 56,000. There are two major markets in Dubai Budget Wedding Shopping. Rolla Market (also known as Zam Zam Market) in Sharjah. I personally stuck to the latter for my wedding shopping because comparatively (a) the rates are better (b) the market is smaller in size and thus less confusing. The clothing stores in both these markets run discounts after every few months and are open to bargaining too. I went for a traditional Muslim bride’s look for my Reception, with paasa and messy side braid. I wore a dark green coloured velvet gown, which was originally a lehenga, I got it customised into a gown. My reception outfit cost me AED 1400. That’s roughly INR 26,000. Hands down, Dimple has to be my favourite Dubai Budget Wedding Shopping store for lehenga shopping, as I got both my main outfits from them. We also got the outfit for the groom, my siblings and some other cousins from the same store. They have a good collection of dresses too, ideal for your trousseau, starting from approx AED 300. They are pretty much a one-stop shop for all things wedding, as they stock bridal jewellery, clutches and shoes too. We picked up all the saris (including the ones for my trousseau, my mom’s wedding sari and those to be gifted to close family members) from a store called Regal. You can expect the decent range to start from about AED 400. Some other prominent stores in the market include Manyavar, Tia Fashion & Junaid Jamshed (if you like Pakistani style). The first thing that was booked for my wedding was the venue, nearly a year in advance. Since we had to juggle between 2 countries for the preparations, our parents fixed the date early on. This department along with food catering, completely belonged to my parents. We were sure of going for an open venue near Mumbai Central, which did not have a monopoly over food and decoration, and could accommodate 1000 guests (yes that was the count). Richardson & Cruddas fit in perfectly and we did not waste any time in booking it one full year in advance. For our Reception, we chose the beautiful Palms Water Resort in Kalyan. It is the best choice in that area. Their package includes food and decoration as well. My extended family knew Vasim Akhtar of Golden Memories, who is a known decorator in the area and also works particularly for Richardson. We booked him for 2 events – Wedding and Mehndi. He did a fabulous job. The entire wedding venue looked dreamy and nearly everyone appreciated his work. He was very kind and patient with me, while I went back and forth with the selection of chairs, table cloth, centerpieces and stage props. Also, for my Mehndi, I showed him a Pinteret reference and he replicated it exactly (although it is quite common now). The entire Mehndi setup was done in a local banquet hall and was as colourful as I envisioned it. Being a family friend, he charged us very modestly. He even did a backdrop for my Haldi at home for free, since we stayed nearby. I highly recommend him. His social media game isn’t really strong, but trust me, he has done some amazing work, which is not uploaded online and rather shown to you when enquired. We really liked a close friend’s wedding video which was covered by Photo Phactory and decided to go for the same team. We did go a bit back and forth over pricing, but eventually finalised them, as we had seen their work and knew the co-owner personally. Except for Haldi, all the events were covered in our package, with cinematography. Haldi was an intimate function at home and I wanted to hire a low-key photographer for it. I did research a lot online and also contacted you, but nobody was willing to take up a small and single event. Finally, my husband recommended Tejaswini, who was his college friend, who willingly agreed to do it, for a reasonable amount. I would simply say that she is really good at what she does. I started looking for an MUA about 6 months in advance. Since I am not too much of a makeup person, I did not wish to go overboard with glitters as a bride. What I also wanted was to remain true to my skin tone and facial features. I came across Gurleen Pabla, through my Instagram research. Her work was literally love at first sight! So much so that, I booked her without a trial. Although she gave me a trial later just to finalise looks, when I was in Bombay, two weeks before my wedding. Due to long distance, we remained connected via WhatsApp for discussing the looks. She never failed to respond to my queries and that is what I liked the most – someone being as enthusiastic and interested in the process as you are. She is also very reasonable for her work. I booked her for 2 events – Wedding and Reception. I booked her for almost my entire family and her team did an equally great job. She is totally cool and fuss-free as a person. I highly recommend her. The makeup for my Mehndi and Sangeet was done by my sisters, both of whom are budding makeup artists. Thanks to their love and expertise in makeup, I saved on this cost for both the pre-wedding events. Both of them did a lovely job. My entire wedding shopping was done in UAE. There are 2 major markets here for the wedding and festive shopping – Meena Bazaar in Dubai and Rolla Market in Sharjah. You will find anything and everything related to wedding in these two markets. I picked my wedding and reception outfit from a popluar store here named Dimple. In fact, the wedding outfits for my entire family including the groom’s outfit, were from Dimple. It is customary to wear gold jewellery on wedding in my family. So I was quite restricted in choice here, but I managed to find some relatable designs at Malabar Gold.